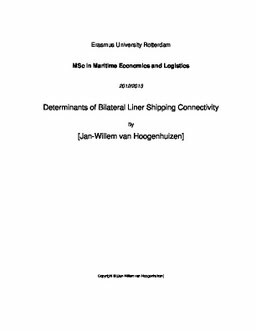 In this paper, the relations between bilateral liner shipping connectivity and its determinants are investigated. It is also the first paper ever in the knowledge of this author that links the structure of the global liner shipping network to the concept of connectivity and where the metrics that define the structure were used as predictors for bilateral trade. In order to address the above stated research purpose of this paper a discussion and description of the global liner shipping network structure is given first and combined with the concept of connectivity. Following this combination, a set of possible predictors of trade have been identified that can potentially act as a proxy of connectivity. Subsequently, these predictors have been tested with the gravity equation of trade using the BV-OLS model by Baier and Bergstrand. After this analysis, a set of potential components for a index that can indicate the bilateral connectivity in liner shipping (the LSBCI) have been selected in order to generate a few possible LSBCI‟s. These indices have than been tested against bilateral trade in order to draw some conclusions about them. By defining the structure of the liner shipping network in terms of nodes and edges, where the nodes represent the countries and the edges the direct connections between these countries it becomes possible to determine a set of metrics that represent the structure of the liner shipping network (such as the degree centrality and cluster coefficients). Furthermore it can be assumed the location of all the nodes in a network is the result of all the forces acting upon them. When applied to the liner shipping network, these forces can vary from the size of the nodes economy to a nodes institutional differences with another node. Liner shipping connectivity itself can be considered to be the measure of access to regular liner shipping services. When this is applied to the concept of the network structure, it can be concluded that bilateral connectivity is this an indication of the relative distance between two nodes in a network. Therefore, in order to get an indication of connectivity. Thus, the components that can form a BLCI need to be a proxy of the forces acting between the nodes in the network. The potential components that have been identified in this paper are the betweenness centrality, degree centrality, nodal strength, cluster coefficient, the K-core, the quality of ports and the LSCI, an index for liner shipping connectivity at country level. However, in the small set of LSBCI‟s generated with the above components there were no significant differences, indicating that only one component that represents the liner shipping structure should be sufficient and that other components that capture other aspects of liner shipping should be included.